It was in either 2005 or 2006 that I received Gohonzon from the SGI (Sokka-Gakkai International), a lay organisation based on Nichiren Buddhism. 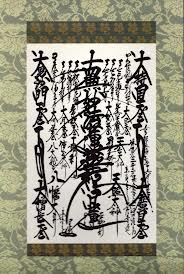 For some time now I have been practicing independently, and this morning I had a revelation while chanting with new friends who practice in the Nichiren Shu tradition: it is time to return my Gohonzon to the SGI. As was pointed out to me today, the Gohonzon I received from the SGI is still property of the SGI - it doesn't belong to me per se. Which means that it was never mine and only on loan. So now begins an interesting process, one that is undertaken with seriousness: the process of returning my Gohonzon. I didn't even realise I had that decision to make until in a flash it was there, fully formed and my mind already made up. It was instant. It was like believing the world was only made of darkness until someone switched on the lights and it changed everything you thought you know. That dramatic and that instantaneous. It seems apt. The past year has been a journey through a number of different forms of suffering and now as I stand at the precipice of 40, a lot of things in my life are looking very different. On 11 March I went into the emergency room because I had chest pains so severe, I thought I was having a heart attack. It turns out that what I was experiencing was a rather severe form of an anxiety attack. I have been making changes that benefit my life since then. I deactivated my Facebook account, I now take lunch breaks. I speak up for myself when I would have remained silent in the past. And here it is, another decision that I didn't realise I had already made: return Gohonzon, keep practicing Nichiren Buddhism and learn more about the Nichiren Shu practice and Buddhism as a whole. I know I will be fine. Yes, there are other changes to make. One at a time. And this change feels 100% right and in line with my life and in line with respecting myself.